There are a variety of ways we LOVE GOD and SERVE OTHERS at Kingswood! We are deeply passionate about being the hands and feet of Christ to meet tangile needs! SERVED OVER 7000 PEOPLE IN 2017! The Food Pantry provides food on an emergency basis to families and individuals from Wheeling Township, which includes surrounding suburbs. We are open on Thursdays from 9:30 AM to 12 PM. Clients may visit us 3 times a year and must have a valid ID showing their address. Help in staffing the Pantry is needed, as well as food and cash donations. Contact Tom and Dawn Karis for more info. Contact Chris Spaeth for more info. 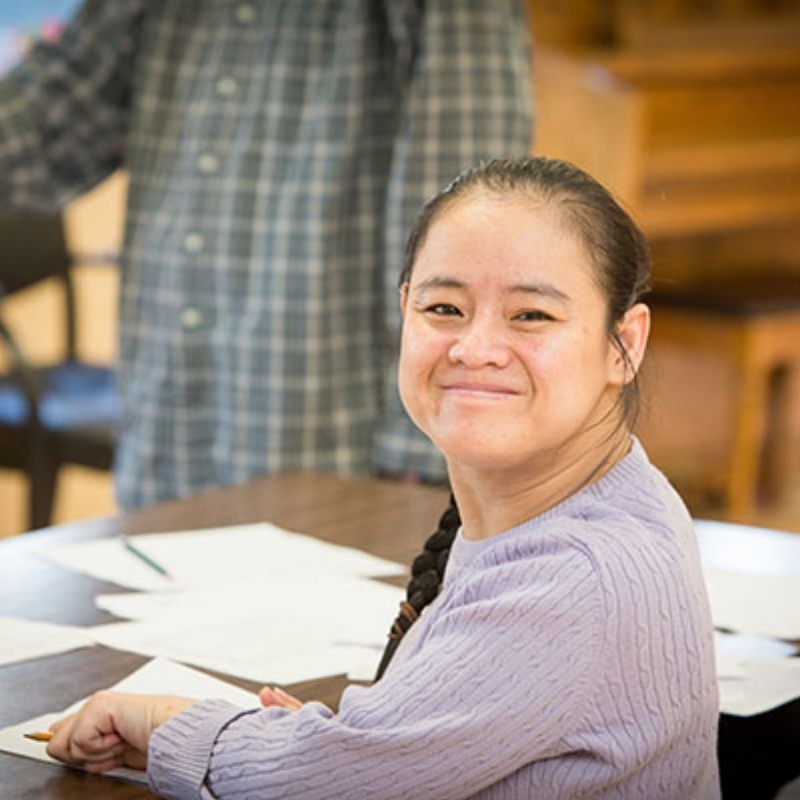 The New Beginnings Job Training Program provides adults with special needs, or other barriers, an opportunity to learn computer, retail, and marketing skills. Job trainees assist volunteers in the New Beginnings Thrift Shop by sorting, pricing, selling items, as well as learning how to list products on a website. On Tuesday nights, volunteers from Kingswood serve meals to the homeless and provide a warm place to spend the night. If you're interested in volunteering you can find more information, attend the volunteers training and sign up HERE. Contact Suzanne Wexler or Susan Wilson for more info or questions. Please sign up to help at the Northern Illinois Justice for Our Neighbors Legal Clinic at Kingswood on Saturday, March 10, 2018. The clinic will run from 3-7 pm, with volunteer hours starting as early as 2 pm and ending as late as 8:15 pm. No one needs to stay the entire time unless you want to sign up for more than one shift. To volunteer you can sign-up here. Sr High work camp is usually the last week of July. We typically do a variety of projects, including construction, painting, working in the soup kitchen, food pantry, and serving meals. These trips are open to 8th grade graduates through recent high school graduates. Our middle school age group also takes two local trips a year. Contact Sheri Brubeck for more info. We march annually in the Buffalo Grove Days Parade. The parade allows us to be a visible presence of welcome and inclusivity to our community. We are one of only two churches in Buffalo Grove and are proud to march each year as we offer an extravagant welcome and invite to those in our community. We have been named the Civic Award Winner several years running. Every year we need walkers, candy donations, drivers and sign holders to make our participation in the parade a success. If you're interested in participatin or helping plan Contact Julie Dagenais . Harvest Fest is an annual community and church event with free admission that offers fun for the whole family. It is generously supported by many Kingswood groups and includes a free petting zoo, games for children, puppet show, bouncy house, bake sale, onsite pumpkins for sale, and much more. The pumpkins are from Navajo Agricultural Products Industry and are sold in an effort to support the Navajo nation and Kingswood’s ministries. We are well known in the community as "the church with the pumpkins"
Kingswood takes 1-3 adult trips per year. One of these is typically with the Interfaith Council on a mission trip and the others are planned by the Kingswood mision's team. 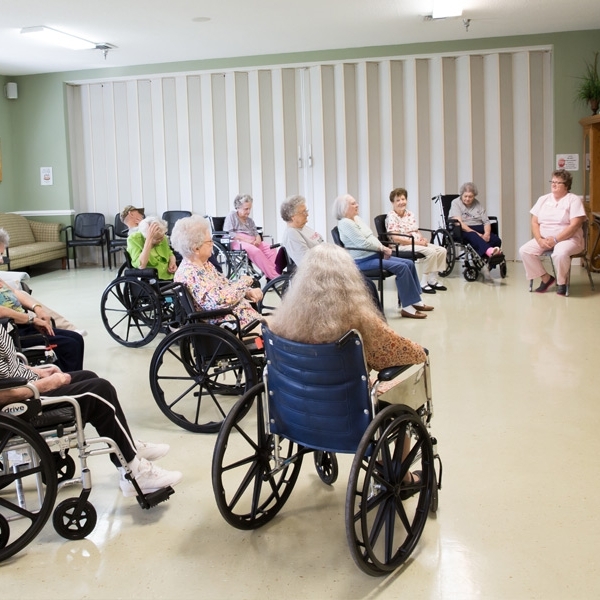 We provide care, compassion and connection through music happens one per month at Alden Nursing Home in Long Grove and Symphony in Buffalo Grove. The residents enjoy our piano accompanist as we sing familiar songs and celebrate monthly birthdays. Kingswood provides a worship service for residents once a month. The residents enjoy singing, a message lead by one of our pastors, and communion. 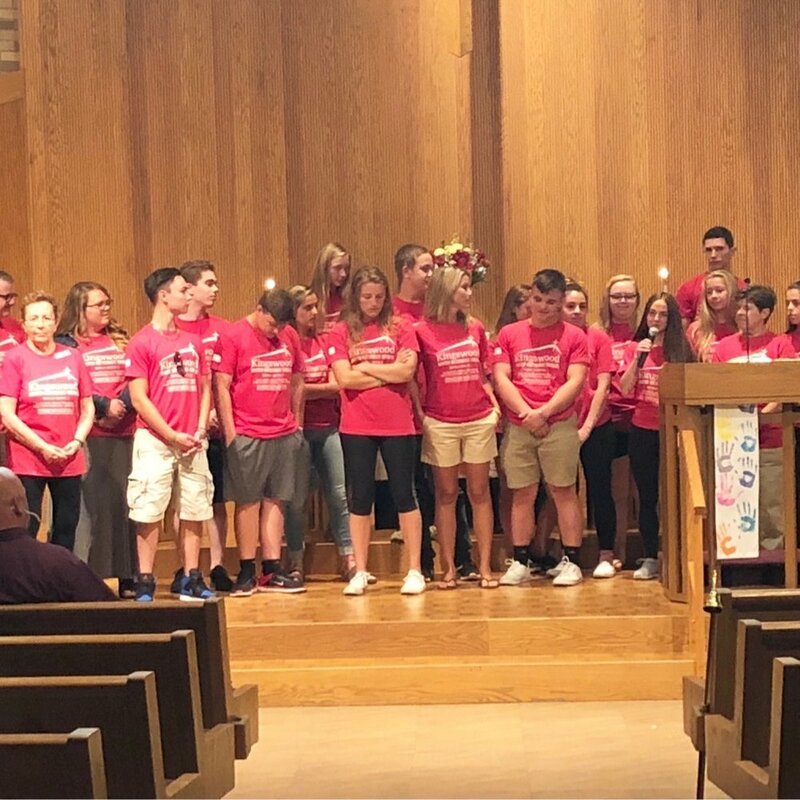 Kingswood Youth supports Northwest Suburban Special Olympics every year by providing workers and athlete care during the spring meet in April each year. Held at Prospect High School, hundreds of athletes from around the northwest burbs participate. Kingswood youth and adults provide direction, support, and care for the event. It is a life-changing event. Contact Clayton Edwards for more information. Each year we participate in "Gifts For All God's Children" This ministry offers Christmas gifts for children in need in our community. “All God’s Children” family information sheets are typically available in the Fireside Room starting in November. People are encouraged to take one as a guide in providing much needed gifts. UNICEF supports efforts of the world's children, through fundraising, advocacy and education. We work with them annually to have our children collect change during Halloween to to help advocate for the survival and well-being of every child. Click here for more info on UNICEF. United Methodist Committee on Relief is quick to be where help is needed. We have always been quick to respond to disasters, locally and globally. Each month we have a different item we collect and donate. This item is listed in our weekly e-news and donated into the bin in the coat room off of the fireside room. Click here for more info on UMCOR. In February and November we provide at least 30-40 care packages to help us stay connected with our college aged young adults and those in the military. The congregation is invited to sponsor a care package for $20. Baked goods, donations of non-perishable individually wrapped items and school supplies are typically needed. People over the age of 18 with a permanent disability or folks over the age of 60 are eligible for this assistance. For a low fee residents receive a hot lunch and an optional cold dinner delivered to them by volunteers. Meals are provided by the Lutheran Home in Arlington Heights where they are picked up and then delivered within the hours of 11:30 & 1:00. Kingswood Church supplies volunteers for two months out of the year. Traditionally in February and July. Contact Wendy Avner for more info. Each year on the first Saturday of February we participate feed my starving children. This is an event where we hand-pack rice, soy, dried vegetables and a nutritionally complete blend of vitamins and minerals into bags which are then sealed, boxed, placed on pallets and shipped to the neediest children around the world. The Kingswood Annual Auction, affectionately known as the “Social Event of the Season” is traditionally held the 2nd Saturday each November. A registration fee of $6.00 is charged to help support the Kingswood Food Pantry. Our silent auction begins at 6:00 followed by a live auction program at 7:30. Child care is provided free of charge. Popular items include theater/sports tickets, new small appliances, gift cards, electronics and many vacation getaways. Donations are raised through members and friends of Kingswood and our many corporate sponsors in the local communities. In 2017 the auction raised over $36,000 for the many missions and ministries supported by the church. Contact Joel Ahrens for more info. Epworth United Methodist Church is an amazing and diverse congregation in Chicago’s Edgewater neighborhood. Founded on November 24, 1888, this community offers a men’s homeless shelter, outreach to neighborhood children, support for local neighborhood groups, and a wonderful place of welcome as a very diverse worshiping community. Served by Rev. Juyeon Jeon, our former associate pastor, Epworth and Kingswood have a sister-mission church relationship. Our UM Women and UM Men groups along with our youth ministry send mission teams to Epworth throughout the year. 2018 will focus on a more in-depth and shared relationship. Contact Pastor James Preston for more information. Memorial Day each year we gather at Knopf Cemetery for prayer, speeches, songs, poetry, and our Scout troop performs a flag retirement ceremony. Knopf Cemetery is over 130 years old and is the resting place for the early settlers of Buffalo Grove and many veterans. Come, join us as we honor those who serve and remember those who have gone before us. Contact Greg McCune for more info. Each year we coordinate a sock collection called Knock Your Socks Off in partnership with the Northwest Suburban Interfaith Council. We collect NEW socks for men, women, and children. These socks are given to our homeless neighbors. Dates for collection are listed each year in the church newsletter and email-newsletter. This ministry is called "Sacred Threads" and is a ministry of the United Methodist Women at Kingswood. This group meet to create Prayer Shawls for members and friends in need of comfort, and to make Lap Robes for nursing homes. Contact Susan Landis-Linville and Susan Kenski-Sroka for more info. We have fully functioning library with many newly released books for all ages and a wide variety of genres. This is a free resource made available to the church community by generous donors. 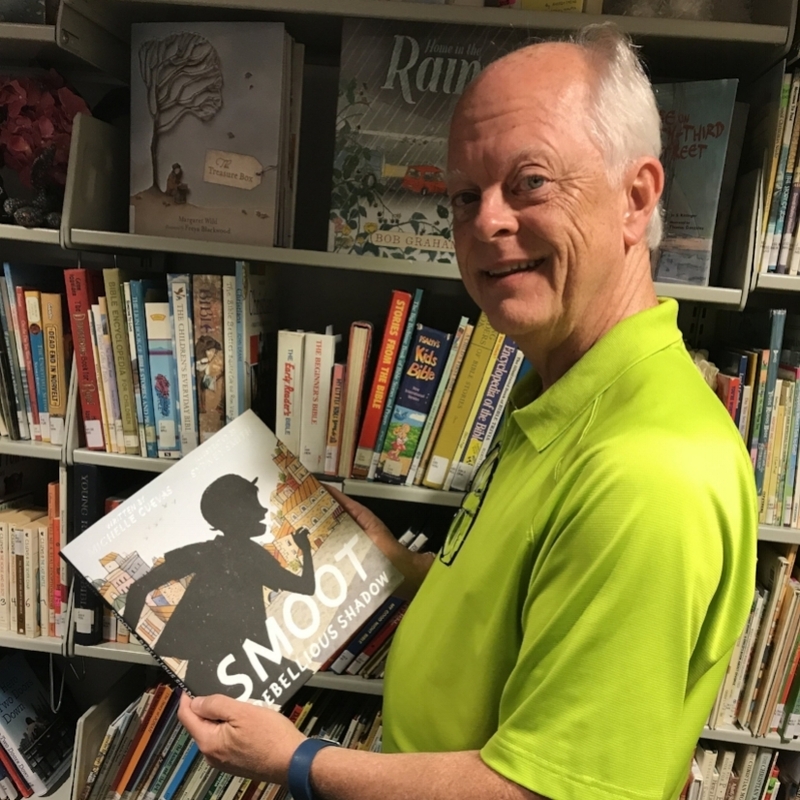 If you're interested in checking out a book from the library, you can do so on Sundays from 10-10:30am. Contact Cheri Stark for more info. Each year we collect an offering for Church World Service. CWS is a Christian service organization that provides blankets, hygiene kits, and baby kits to places of poverty and great need in the US and around the world. The blankets are used for refugees of war and displacement as well as victims of disasters like flooding, fires and homelessness. Your support toward CWS will help to love and serve others by providing blankets to many around the world. Contact Mark Rohde for more info. Each year we gather at the Wheeling Aquatic Center (327 W. Dundee Road in Wheeling) from to support our Kingswood Food Pantry. The Aquatic Center has several pools, slides, volleyball, children’s area and more. We hope you will join us and invite a friend to come with you! Email Clayton Edwards or sign up in the Fireside Room.. Cost will be $5 per person or $20 max per family and donations for the Food Pantry. Each year, we participate in a 5K community event to help feed those in need of food in our area. The event is presented by the Interfaith Council. There aren't any entry fees and non-perishable food donations are appreciated. All money supports area food pantries including Kingswood's. Throughout the year, we sell beautiful hand carved spoons, fresh roasted Guatemalan coffee, and inspirational t-shirts. All profits go toward providing educational Scholarships for students in Guatemala.